For most of Holencik's 30 years of business Mark Holencik was content to sub out gutter installation to other Lehigh Valley contractors. However, after years of finding installers resistant to his preferred methods, 10 years ago he made the decision to hang them himself. Job quality is Mark’s main concern and he felt the only way to accomplish high quality installation was to invest in his own gutter machine. It only made sense to be able to install a roof and gutters if customers wanted both, so Holencik Gutters was born. Since then, Lehigh Valley residents have placed their trust in Holencik for all their gutter needs including new installation, repairs, or cleaning. 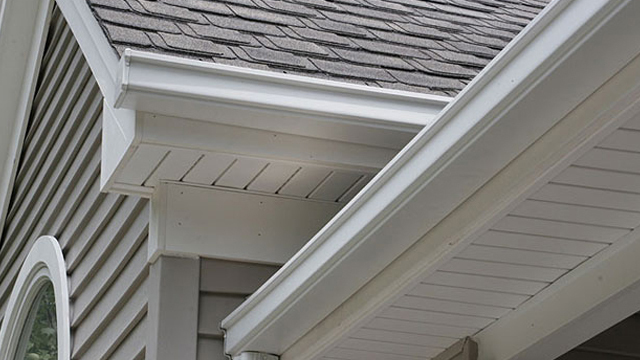 At Holencik we believe the two major aspects of gutters are thickness and hangers. In the Lehigh Valley, most gutters are .027 gauge (thickness), however we prefers to use .032. We also prefer to put hangers every 2 feet. While we believe this should be the standard, many installers stretch that out to 30 inches, 3 feet, 40 inches between hangers. As a homeowner, you or someone you hire should clean out your gutters about twice a year. This is important to maintain efficient water flow and drainage off your roof and away from your home. To cut down on gutter cleaning needs, we recommend installing The Leafproof™ Gutter Guard System onto your home and eliminating clogged gutters forever.